Jimmy D. Robinson Inc.'s Rare Art Collections is currently seeking rare fine works of art for appraisal, purchase and sale. As a certified International Fine Art Appraiser and dealer, Mr. Robinson is highly sought after by major corporate and private collectors. Are you or your business seeking to sell your current rare art collection to help liquidate assets? Jimmy D. Robinson Inc.'s Rare Art Collections ("JDR") is currently seeking rare fine works of art for appraisal, purchase and sale. With today's current stock market woes and unsteady world economy, the business of rare art collecting is still a strong and wise investment. 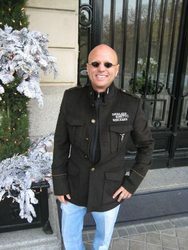 JDR is a highly unique, successful and honorable dealer of exceptional fine art works. Located in West Palm Beach, Florida, JDR is a heartbeat away from some of the most discrete and esteemed art collections in North America. JDR has for many years acted as one of the top private and personal representatives of astute collectors and exclusive estates to buy and sell multi-million dollar works of art including some of the world's most renowned paintings and sculptures. From such artists as Martin Johnson Heade (Hudson River School), Frank Stella, Picasso, Louise Nevelson, Alexander Calder, John Hoyland, Roy Lichtenstien, Winslow Homer, Louise Nevelson and Le Pho to 5-Star hoteliers, private museums and personal collectors worldwide. JDR is owned and operated by Jimmy D. Robinson, prominent published poet lyricist and song writer, art collector and certified International Fine Art Appraiser (I.F.A.A.). Robinson travels the globe and brings his business to you, making it convenient to receive an expeditious appraisal and for all parties to close a deal. Through his universal network, Mr. Robinson has established JDR as the premier Virtual Art Brokerage, arranging private viewings and confidential transactions for the benefit of its clients through secure modern technologies, unlike common Internet galleries. JDR has successfully procured the most highly sought after rare works of art; many never before viewed publicly. By eliminating the often multiple levels of intermediaries and procuring its art directly from estates and private sellers, JDR also prides itself in its very competitive pricing. Through Mr. Robinson's Palm Beach and Beverly Hills extended relationships, JDR has developed a reputation for working efficiently and effectively with collectors and families to sell individual pieces as well as entire estates and collections, of all values. Mr. Robinson counts among his many clients: major corporations and billionaire investors as well as attorneys, doctors and executives. JDR also deals and helps educate first time collectors with great care. Mr. Robinson delights in sharing his great passion and knowledge of art with all of his clients; helping them build value by investing in art as a way of diversifying their portfolios while bringing beauty to their homes and offices and corporate collections. As an International Fine Art Appraiser, Mr. Robinson is sought after by major corporate and private collectors to provide appraisals for insurance and financial reporting purposes. Such projects are done on a flexible basis to meet the client's needs. To arrange a confidential consultation regarding the sale or purchase of your fine art works, contact JDR at 1-(561) 602-1400, or email Jimmy D. Robinson directly at jimmydrobinson at comcast dot net. Jimmy D. Robinson, Inc. - Rare art Collections. Seller to the Billionaires specializes in brokering large collections of art as well as multi-million dollar paintings to a private clientele, 4 & 5-star hotels and corporations worldwide, including Contemporary, Hudson River School, American Impressionism, Old Masters, American & European Paintings and large rare art collections. Other Features: Jimmy D. Robinson, Inc.[Rare art Collections] welcomes consignments and prides itself in maintaining client confidentiality for private collectors worldwide in the viewing, purchasing and/or sale of important artworks, many never seen. Gallery Artists: Contemporary, Hudson River School, American Impressionism, Old Masters, American & European Paintings and large rare art collections. Jimmy D Robinson , Inc .
JDR Inc. Logo Jimmy D. Robinson Jimmy D. Robinson Candid Shot in Studio Example: Yolande Ardissone, Bouquet A LA Monnaic Du Pape, 1974 Media Giants Logo - JPEG Jimmy D. Robinson travels worldwide to clients.